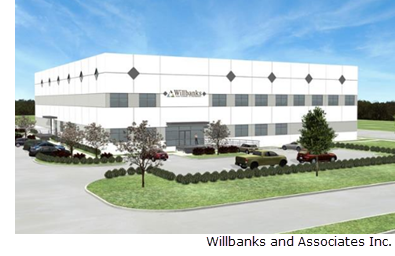 Willbanks is purchasing the largest of three buildings being constructed by Adkisson Development for a new corporate headquarters. The new 35,000-sf tilt wall structure will include approximately 15,000 feet of office, classroom, and demonstration-lab space. There's also an additional 20,000 feet designated to a high bay warehouse and fabrication shop. The facility will be the new home of Willbanks and Associates Inc., Willbanks Contractor Support LLC, and Boiler Management Ltd. (The Teal Company).